Having moved from New York to Paris in September of 1955, Paul-Émile Borduas underwent a difficult time, physically and emotionally. Never robust, he was plagued by illness and fatigue, by loneliness and depression, and by frustration that his dreams of success in Paris were slow to materialize. His state of mind is well documented in François-Marc Gagnon's critical biography, and more intimately in Gagnon’s co-edition (with Gilles Lapointe) of the newly discovered, fascinating correspondence of Borduas with Rachel Laforest, a divorced single mother living in Montreal, who may have been one of Borduas’s reasons for leaving New York, hoping to live with her in Paris. Despite these problems, and despite many weeks spent on what might be called therapeutic solo driving excursions through central and southern Europe, Borduas remained active as a painter, taking his art in new directions and producing some of his most widely recognized works. 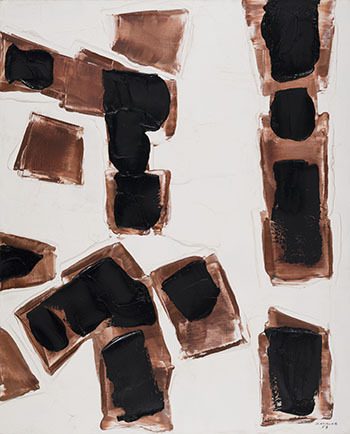 One of the characteristics of Borduas’s New York paintings was that they retained an all-over, gestural quality, with predominantly white surfaces of thick paint, manipulated with a palette knife and modulated by what Gagnon has called “coloured caresses.” In Paris, Borduas began experimenting with quite large areas of black in various sizes, shapes and positions, juxtaposed with the white. I say “juxtaposed” because this black/white dynamic (what is foreground, what recedes - are the black and white balanced in “cosmic” space?) has been much discussed. To his friend Michel Camus, Borduas described these paintings as very austere, but with a “strange flame” bursting from them. But this stark black/white dynamic was not all Borduas was exploring. By 1958, he had moved on to a suite of monochromes in subdued greys, whites and reds. Also, at roughly the same time, he was working on a variation of the black/white motif by introducing areas of rich chestnut brown. 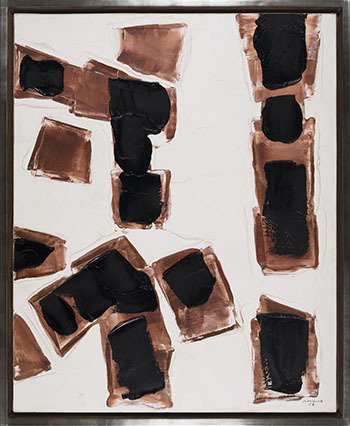 In about a dozen of these paintings a specific structure emerged: broad strokes of brown imposed on a nuanced white background in various patterns, and over those brown areas, large spots of pure black. Into the “cosmic” space of the black-and-white series had floated areas showing not only a layering of colours, and therefore depth, but movement. Dominos belongs to that group of paintings, apparently produced in a burst of activity early in 1958. Martha Jackson, the well-known gallery owner who had helped and encouraged Borduas in New York and later in Paris, visited his studio on rue Rousselet in May 1958. She obviously liked these new and unfamiliar works, because five of the seven paintings she chose for shipment to New York, including Dominos, were obviously members of the white/brown/black group. Of that selection, some were quite static in composition, while others were almost calligraphic and gestural. Dominos lies somewhere in the middle, with solidly placed shapes that give a hint of shifting action. In all of these paintings we see luscious impasto, subtly modulated whites, rich blacks and browns. The year 1958 was a good one for Borduas. It was the 10th anniversary of the publication of the Automatists' manifesto, Refus global, with signs of a broadening, positive recognition in Quebec for this document now recognized as crucial in the province’s modern history. In France, Borduas was about to get some of the attention he deserved, with a solo exhibition at the Galerie Saint-Germain in the spring of 1959. But in just a few months, all painting would stop for Borduas. We thank Ray Ellenwood, professor emeritus at York University and author of Egregore: A History of the Montréal Automatist Movement as well as numerous articles on the Automatist painters, for contributing the above essay. 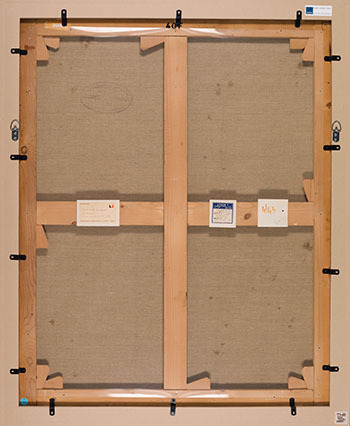 This work is included in François-Marc Gagnon’s online catalogue raisonné of the artist’s work at http://www.borduas.concordia.ca, #2005-1327.